The resignation of Bill Rauch focuses our attention on what he has achieved in Ashland in new productions of "Othello," "Henry V," "Sense and Sensibility" and "Destiny of Desire"
Your faithless correspondent has now spent a week dithering over all that this particular brainpan could usefully muster about opening weekend at the Oregon Shakespeare Festival. Hey, these observations and opinions don’t come ready-made! And maybe it’s harder when said correspondent finds that brainpan in sync with the productions under review and their devotion to the most basic act of theater: telling true stories by locating the humanity within them. A certain melancholy is also involved, because the ground shifted beneath the Festival last month, when artistic director Bill Rauch announced that he was leaving next year to become the first artistic director of the Perelman Center in New York City. That news changed the context of the four weekend premieres of the 2018 OSF season. Suddenly, they became a sort of emblem of the changes that Rauch has brought to the festival—and to American theater in general—during his run at OSF, which began in 2007. Rauch was ahead of the times at OSF, although he was also drawing on important changes initiated by previous artistic directors Henry Woronicz and Libby Appel. From the beginning he explicitly linked the festival to social change, both internally and onstage, embracing diversity, feminism and social justice, well ahead of other regional theater companies and even national equality movements—#blacklivesmatter, #metoo, #occupy. During his tenure accessibility projects flourished, sharpened their focus, and had a real effect on how the festival does business and what it puts onstage. Given the backdrop of Rauch’s departure, the weekend emphasized Rauch’s approach. It highlighted the racism and misogyny in Othello, the consideration of leadership in Henry V, a deeply diverse cast enacting a 19th century novel (Sense and Sensibility), and the riotous celebration and send-up of telenovelas, Destiny of Desire. Taken together, they made a powerful aesthetic case for artistic diversity in all its forms: The audience directly benefits from Rauch’s inclusiveness, because the plays had a sharper edge, a more telling angle, and, ultimately, a deeper truth. At least that’s how I saw those first four productions, with a little guidance from a panel discussion that featured the weekend’s four directors. Rauch himself directed Othello, a tragedy that nearly always leaves me in emotional tatters. This production, with its cinematic use of projections, movement, set design, represented the regional theater machine operating at smoothest purr. Full of actors in full possession of their characters, reaching out to us in ways more deeply considered than we can imagine, and STILL, the indivisible core of Othello proved inescapable—its sheer ugliness, a description of humanity that should give us a fearful shudder every time we see it. “The struggle is to find our common humanity in a story that is this ugly.” That, in the barest shorthand, is the seemingly impenetrable fog that every production of Othello must enter. It happens to be Rauch speaking … and passing on the accumulated practical wisdom of the theater world on this play. And then you have a crushing thought: that Rauch completely understands that we in America are living inOthello, every day, outside the walls of the theater. How do we find our common humanity in a story, our story, that is this ugly? “A story that is this ugly.” And that is exactly why he decided to stage it. So, the theater world thinks it can redeem Othello, all of its misogyny and racism and base motives, by finding the common humanity in the characters. How can it do that? After one of the longest questions in my long history of interviewing artists, Rauch answered, “pragmatic utopianism.” That was the answer to my impossible-to-reproduce question, and not to a question about how to make Othello something people could stand to sit through. But in some ways, it fits. Ugly, by the way, is an understatement. The culture the play describes is racist and misogynistic, and the key carrier of both social diseases, Iago, successfully schemes to bring down the African hero (probably: Shakespeare call him the Moor, which might mean African via Spain). The unfolding details of this process lead to the play’s awful conclusion, a murder-suicide and a connected murder, that the audience witnesses with growing horror (even when we know what’s coming). What did Rauch mean by pragmatic utopianism? Perhaps Othello supplies us with some clues. Design Integration: The festival has invariably looked great since my first visit in the early 1980s, and it has learned to take those design values and integrate them with the text and its interpretation in ever deeper ways. 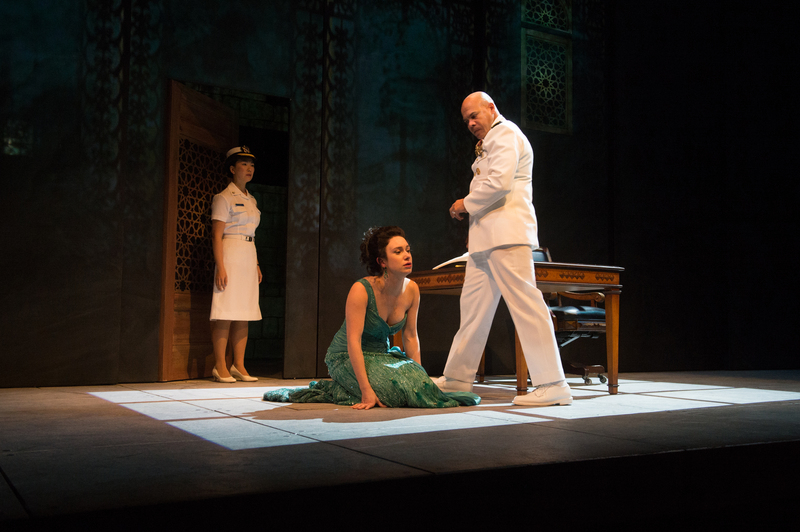 This Othello features a savvy and luscious projection system that manages both to move us around the Mediterranean, from Venice to Cyprus, and simulate sunsets and rainstorms. And the set, apparently simple, allows Rauch to keep the rather small company in seemingly constant motion around the stage and up a long ramp that plays many roles itself. As a result, the play never settles into static talking heads taking their turn with the text. We never get stuck on the evil. Focus on story: The story, ugly as it is, is the center of the production, and decisions by the actors onstage always feed that story. Even what seem like idiosyncratic choices—Iago wandering into the audience for his evil soliloquies, for example—work inside the context of the story as Rauch and company are telling it. Danforth Comins’ Iago benefits from this, becoming a character in a story instead of a representation of Evil Incarnate. Not that we sympathize with him, of course. When you emphasize story, the one truly heroic moment of the play—Emilia’s resistance to her husband Iago and defense of Desdemona to Othello—stands out. And Amy Kim Waschke as Emilia becomes a heroine in the process. Is there redemption in Othello? If there is, it can only arrive through Emilia and her sacrifice. 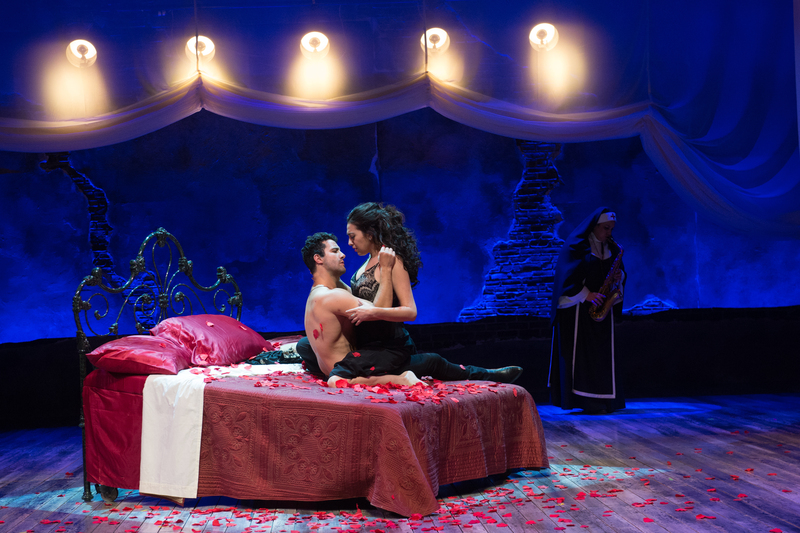 Desdemona’s steadfast love of her husband, Othello, is not quite enough by itself. Finding the humanity: Deliberately searching for the humanity in the story led Rauch and his Othello, Chris Butler, to give Othello an African diaspora accent—Sudanese, the program notes say. This emphasizes Othello’s outsider position. He is separated from the rest of the characters by race and country of origin, and the accent signals that. It’s also musical: Butler uses it to explore a wide range of vocalizations, timbres, octaves. That’s another way he stands out in this crowd, and from most of the stentorian baritones who usually speak Othello to us. We understand him a little better, perhaps, and like Iago, he’s humanized in the process. We may still want to scream out to him from our seat: Don’t believe Iago! But then, we feel the same thing every day in an America that increasingly feels like a Shakespearean tragedy. 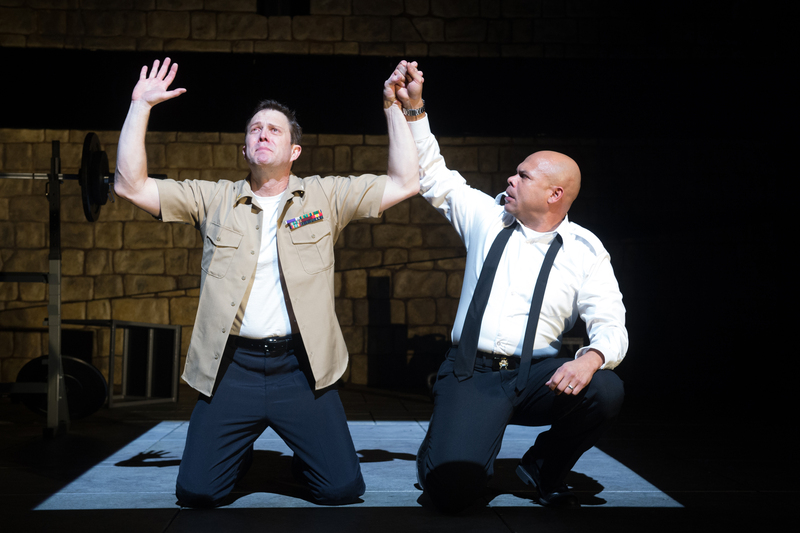 This production of Othello makes an excellent introduction to this difficult play, but even if you’ve seen other Othellos, even great ones (Derrick Lee Weeden’s version for OSF in 1999 with Anthony Heald as Iago, for example), I’m guessing that this one will seem fresh to you, lead you to new considerations. All of the directors at one of OSF’s opening weekend public events mentioned “humanity” at one time or another. I have to admit, it’s not my favorite word. You could spend a human lifetime trying to figure out what it means, what constitutes humanity and what constitutes “non-humanity.” And “inhumanity” seems to be a constant companion to “humanity”—do we want the nose of that conceptual camel to slip inside our fragile tent? As the wind howls outside? But still, in everyday language we understand the word: It’s what binds us, gives us a glimpse into the interior life of others (and our own interiors, for that matter), helps us find a basis for tolerance, if not agreement. And though it sounds, yes, remote and conceptual, we use it to describe the most basic of human experience: love and loss; birth, maturity, aging and death; need and compassion. 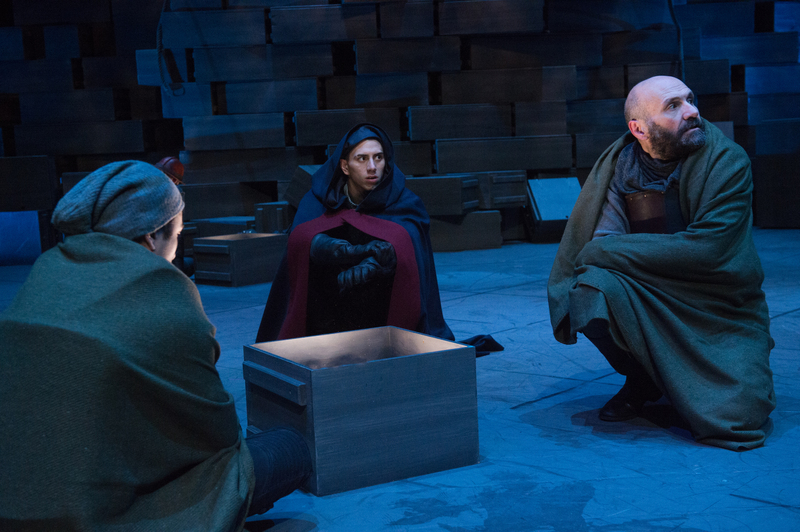 When Rauch and the other directors talked about finding humanity in the plays, they were mostly talking about the rehearsal room, where the actors attempted make the deepest possible connection with their characters as they understood them, a process (if you’re playing Iago, say, or Othello) that can be harrowing. 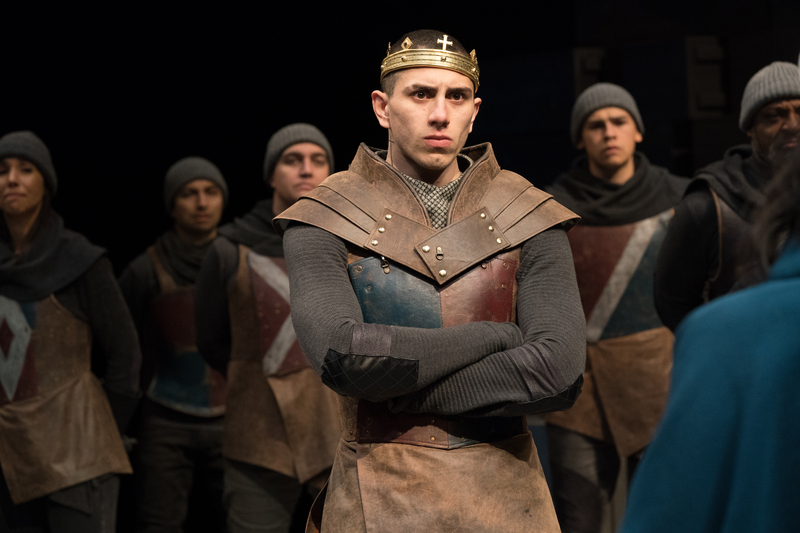 Henry V director Rosa Joshi discovered that for her assignment, “a lot of the humanity walked into the room.” The rehearsal room. At the beginning of Henry V we learn that Falstaff, one of Shakespeare’s greatest inventions, has died, and his little band of followers, who had laughed, riposted and drunk with him in Henry IV, Parts One and Two, are saddened by the news. When that happens in THIS production, which features mostly the same cast, it happens to be true in real life: G. Valmont Thomas, who played Falstaff in the two parts of Henry IV last season and had been part of the festival company for 14 season, died on December 18 last year. You can imagine the feeling the actors who worked with Thomas last year have when they learn in the play that Falstaff has died. That’s not the only example. During the past two years, festival regulars have been able to follow Shakespeare’s story of Prince Hal, through his rowdy early days, to his moment of truth as the throne room beckons, and finally to the field of Agincourt with a small band of brothers as the might of medieval French cavalry approaches. At the same time, they have watched the growing power of a young actor, Daniel Jose Molina, as he has taken on these signature roles. That’s one of the pleasures of a repertory theater company, which can keep a company of actors together through cycles such as this one. As King, Molina is assured, at least outwardly, but Shakespeare gives him doubts—about himself and his decisions, about the invasion of France he is undertaking, about his men. Because the play is in the smaller Thomas Theatre, we see those struggles, too, sometimes a few feet away, and then his recovery from them, how they come to define his personality as a leader. “In a democracy,” Joshi said, “we have to think about the personalities of our leaders.” Molina’s Henry V becomes a man worthy of following right in front of our eyes. Natural delivery: When Molina delivers the famous lines in the play, specifically the “we few, we happy few, we band of brothers” speech, they seem to erupt from him spontaneously, even a little haltingly. He’s not trying to give the most rousing Crispin’s Day speech possible; he’s trying to give the most honest one he can deliver. And its effect is all the greater for Molina’s approach. Richard Hay’s moving, interlocking box set: Hay has been designing sets at the festival for 61 years. One year when I wrote for The Oregonian, I spent most of the review talking about his winsome way with stage design. This one is modular and so original that maybe Ikea should take note, signaling scene changes and reminding us that we are in the present time, watching a play written in at the turn of the 17th century about events that took place in 1415 (Shakespeare enhanced the drama by condensing events). Those boxes participate so much in the action that they almost become characters. Maybe you’ve read Sense and Sensibility or maybe you know about the Dashwoods from the 1995 film version, directed by Ang Lee, and starring Emma Thompson, Kate Winslet, Alan Rickman and Hugh Grant, as amiable a group of actors as you’ll find in all of Devonshire, where the female vector of the Dashwoods has relocated after the death of Mr. Dashwood and his replacement as pater familias by his weak son, who sends the women packing from the family estate at the urging of his wife. See? You read a little Jane Austen and suddenly your sentence length triples! The stage version here is by Kate Hamill, who has made it her personal project to adapt and write plays with great parts for women. And sometimes she plays those parts herself (she originated the role of Marianne in Sense and Sensibility). I think this is called DIY. But if you go expecting a Sense and Sensibility that’s just loaded with posh British accents and an adorable cast of standard-issue white actors, well, you’re in the wrong part of Devon. It’s still a comedy, but with a cast diverse in race, ethnic origin, size, and definition of “adorable”: Suddenly the edge is a little sharper, the casual cruelty heightened, the morality tale metamorphosed into a critique of oligarchic manners and mores in Austenland. If it all doesn’t turn you into a feminist and an #occupier, well, you’re just not trying hard enough! 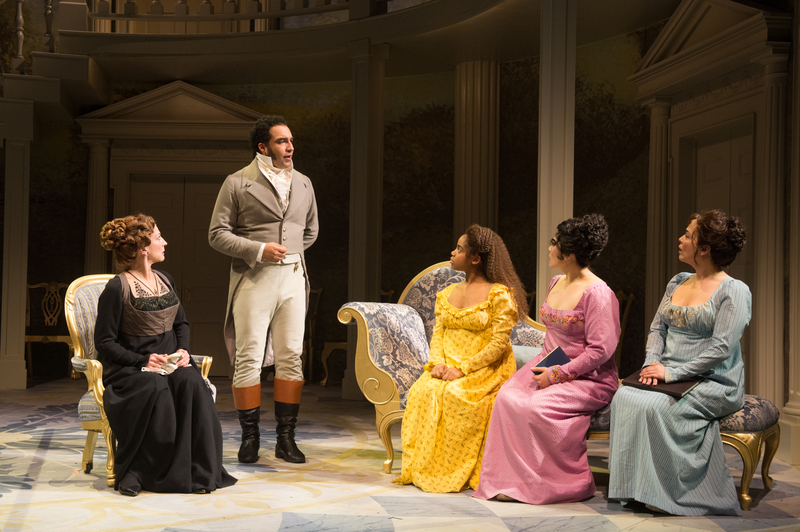 “Part of our job is to get underneath the text, underneath the words, underneath the pain,” director Hana S. Sharif said, about theater in general, but it applies to this Sense and Sensibility, too. Not that you should abandon hope, all ye who enter here: This is a comedy, and it ends happily, but not without the pain that Sharif, the artistic director at Baltimore Center Stage, mentioned. Two billion earthlings of the persuasion homo sapiens watch telenovelas. Which is to say, in effect, that two billion of your fellow humans are addicted to telenovelas, a television form that resembles the American soap, except that it isn’t open-ended. The telenovela is usually wrapped up in one year, so while it’s longer than a mini-series, it’s shorter than Days of Our Lives. Sebastian Jose Castillo (Eduardo Enrikez, left) and Pilar Esperanza Castillo (Esperanza America) share a romantic encounter. Sister Sonia (Catherine Castellanos) provides musical accompaniment in “Destiny of Desire”/Photo by Jenny Graham, Oregon Shakespeare Festival. I bring this up because Destiny of Desire is a staged send-up of the telenovela invented by playwright Karen Zacarias, and having watched it, I can understand why they are so popular. Director José Luis Valenzuela told us that he had never watched a telenovela before he directed Destiny of Desire the first time. He started researching. He continued to research. And before he was done, he had watched 450 hours of telenovelas. “I wanted to learn the trick,” he shrugged as the audience laughed. There’s research, after all, and then there is addiction. Destiny of Desire has all the elements of telenovela except the length: It runs an exciting 2 hours and thirty minutes of preposterous melodrama, more preposterous plot twists, children switched at birth, illnesses whose courses fit the ever-shifting plot, threats, stage violence, passion, more passion, love at first sight, yet more passion, multiple attempts to suppress all that passion by perfect stage villains, and… singing, most excellent singing by Ella Saldana North and Experaza America and Eduardo Enrikez! Surely, that’s all you need to know? Outside of Oklahoma!, this is likely to be the hardest ticket to secure at the festival this year. It’s that much fun.